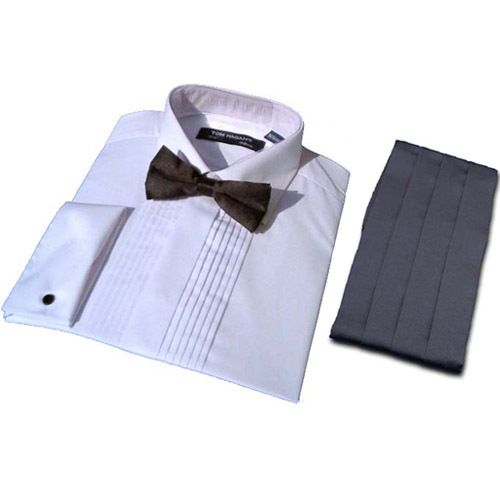 This package combines one of our good quality white dress shirts with a cummerbund in a choice of colours and materials. Our standard dress shirts are manufactured from 35% Cotton 65% Polyester. This allows for minimal shrinkage after washing, enables easy ironing, but also ensures they are very comfortable to wear. Our 100% Cotton shirts have that added luxury feel to them. They are made from a medium weight cotton, that is both soft to touch and comfortable to wear. The price includes a free pair of black silk knot cufflinks as well as a black pre-tied bow with the option to change colour and material. Choose from either a Fold Down or Wing Collared shirt. Thank you so very much for your prompt response to what we t ..